Eugenia joined the US Army during the Vietnam War and served 27 years of continuous active duty. 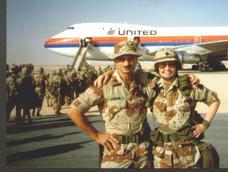 Here, she is about to fly home after Operation Desert Storm, May 1991. After her retirement in 2000, Eugenia moved to Kent County where she became involved in many charitable, conservation and veterans activities. Here she is receiving a thank you from the Southern Delaware Heart Association for her 5 years on the Board, four of which she served as President. In addition, Eugenia served as a Kent County Planning Commissioner since 2006. 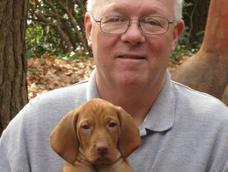 "I served my country for 27 years; I served Kent County for 12 years. I'm ready to serve in a new capacity." "Life moves pretty fast. If you don't stop and look around once in awhile, you could miss it"
-- from "Ferris Bueller's Day Off"
Eugenia married LTC Donovan F. Jagger in 1976. .When Don was diagnosed with a fatal brain disease, Eugenia shared their pain with others to promote awareness. Here Eugenia is being awarded the Horatio Gates Medallion, a medal authorized by Congress and struck by the US Mint. She was the 360th person to receive this medal since the founding of our nation. She won it for doing a job similar to that of Kent County Recorder of Deeds, but more complex with more than 125,000 transaction per day, and under combat conditions. 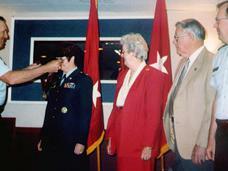 Also shown, the Adjutant General of the Army, parents Dolly and Gene Thornton and husband Don Jagger. For more about each topic, please click the image.